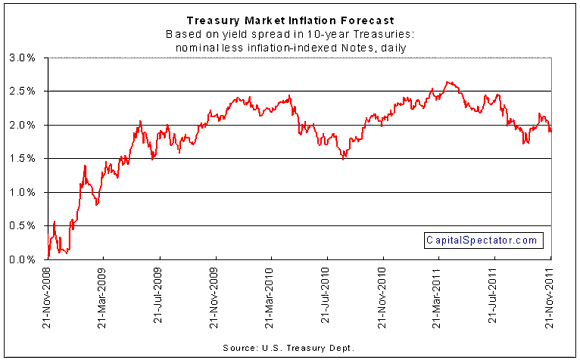 The Treasury market’s inflation forecast is slipping… again. If the descent rolls on, it’ll be a dark sign of things to come, just as it has been in the post-crisis mire of recent years. The battle isn’t lost yet, but the forces of inflation and deflation are clearly locked in a new round of conflict. For the moment, it’s unclear which side will win if we’re looking solely at the yield spread between the nominal less inflation-indexed 10-year Treasuries. But in a world once again flush with deflationary instincts, confidence is low that that defenders of prices can hold the line. The good news is that the inflation forecast, which has been a harbinger of sentiment and markets in the New Abnormal, is above previous interim troughs. But as the euro crisis deepens and the odds rise for austerity via automatic budget cuts in the U.S., faith that we’ll pull away from the brink is growing thin. Yesterday’s 1.8% drop in the stock market surely hasn’t inspired hope. 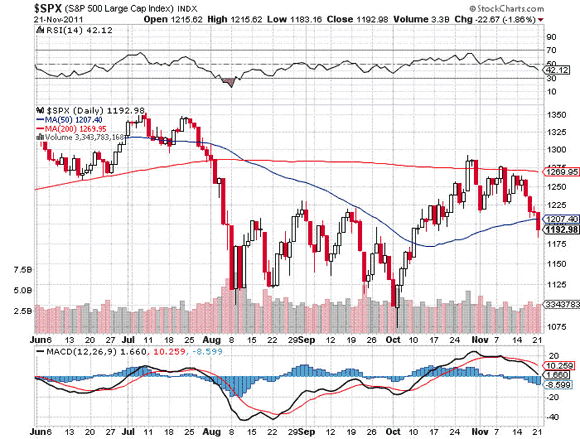 Equities never recovered from the summer’s momentum loss and so the technicals remain grim. The S&P 500 is under its 200-day moving average again and the 200-day moving average has been under its 50-day average since August. The only real support for the forces of growth has been the recent strength in economic reports, starting with the declines in new jobless claims in recent weeks. The question is whether the renewed strength in the American economy, albeit relative to the summer slump, will hold up in the face of Europe’s woes and Washington budget-linked political paralysis. Perhaps the answer lies with deciding if the Austerity Now folks win the political debates. They’re certainly not giving up the battle. And perhaps they’re on a roll. The barricades—the last defense in Europe—seem to be crumbling. Will they succumb? Recent economic news from last month seems to be of limited value because sentiment has changed in the last week or two. Will the numbers follow? The answer arrives one data point at a time starting… now.